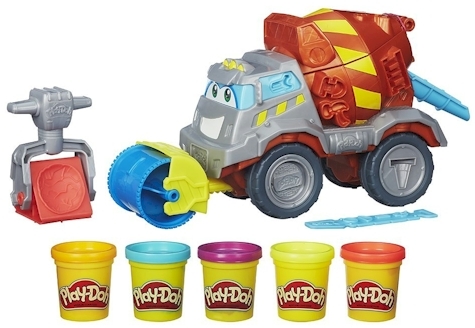 Amazon has got this Play-Doh Max The Cement Mixer for $17.43 with free Prime/SuperSaver shipping, the lowest recorded Amazon price on this toy. (The average Amazon price on this toy is $24.63.) This is an Amazon #1 Best Seller. Description: Fun-struction site ahead! Gear up for a squish-smashin' day at the wacky work site with Max the Cement Mixer. No hard hat needed for this job: just squish some Play-Doh compound into the mixer and press out colorful pretend cement. Use the extruder rail to squeeze out all kinds of shapes. Next, load the steamroller to the front of the truck or use it by hand to roll out your own roads, and then demolish them with the jackhammer stamper! You can also press out beams and mold bricks, cones, and more to complete your construction scene. With 5 Play-Doh colors and your imagination, you and your freewheeling friend are ready to take on almost any job! Play-Doh and all related properties are trademarks of Hasbro.